Gangs of Wasseypur director Anurag Kashyap will return to the Croisette in a few weeks with his new film Raman Raghav 2.0, the tale of a serial killer in Mumbai in the 1960s, which will play at the Cannes Director's Fortnight. The line-up of 18 films was announced this morning, and it's quite an interesting mix. The section will open with Sweet Dreams by Mario Bellocchio, starring Bérénice Bejo, about a boy struggling with the death of his mother. The closing film will be Paul Schrader's Dog Eat Dog, starring Nicholas Cage and Willem Dafoe as recently released prisoners trying to adapt to civilian life. Among the other interesting titles are Laura Poitras' new documentary (one of the few to be in the festival this year), Risk; the late Sólveig Anspach's final film The Aquatic Effect; My Life as a Courgette, a stop-motion film about a boy names Zucchini who tries to find his place in a group home, directed by Claude Barras; and Joachim Lafosse's After Love, about a couple who split up but continue to live together due to financial problems. Chile seems to have something of an unofficial spotlight, with two highly anticipated films about artists. 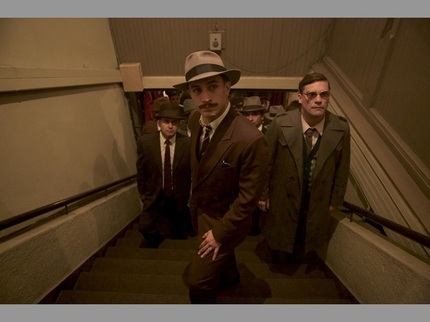 Pablo Larrain's Neruda tells the true story of the detective (Gael García Bernal) who hunted for famed poet and political dissedent Pablo Neruda (Lius Gnecco). Cult film maverick Alejandro Jodorowsky returns with his new documentary Endless Poetry, about his early adult years when he was introduced to the bohemian artists of the 1940s in his country. Full list of the features and short films in the fortnight is below.